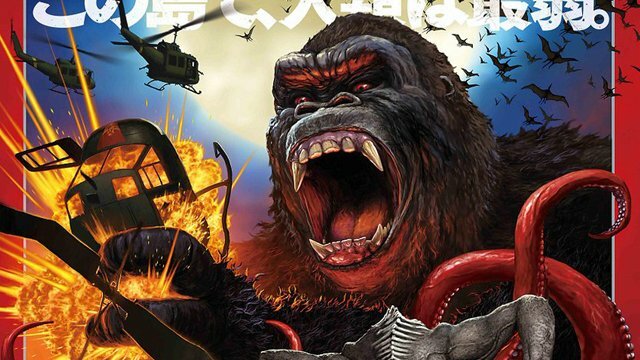 You’ll Go Ape Over This Japanese Kong: Skull Island Poster! Check out an impressive Japanese Kong: Skull Island poster! Behold, the mighty Kong on a fantastic Japanese Kong: Skull Island poster! Director Jordan Vogt-Roberts shared the stylish design on social media today, following its official unveiling in Japan. “Can we talk about how great our Japanese Kaiju poster is?” the director asks on Twitter. Check out the Japanese Kong: Skull Island poster in full in the gallery viewer below and catch the Legendary Pictures and Warner Bros. Pictures release in regular and IMAX theaters March 10. IMAX is also delivering a cool poster design domestically. Just after the new poster in the gallery viewer below, you can take a look at a special design that pays homage to Francis Ford Coppola’s Apocalypse Now. What do you think of this Japanese Kong: Skull Island poster design? Are you planning to check out the film when it hits theaters next month? Let us know your thoughts in the comments below!